Why is it easier for us to visualize the end of the human race, than the end of the free-market capitalism? This is the driving question behind the latest collaboration between Slavoj Žižek, the superstar philosopher/psychoanalyst/cultural critic of our time and director Sophie Fienne's in their new documentary, The Pervert's Guide to Ideology. It's their second film since the widely successful The Pervert's Guide to Cinema in 2006. Clocking at 135 minutes, Ideology is arguably less entertaining than its predecessor despite the charming presence of the famed philosopher in several iconic movie backdrops, gesticulating wildly and sounding like the Eastern European Sylvester the Cat. But this film is a denser, more serious examination of our consumerist society that asks many of the important questions of our time, and will require your full attention. As the film jumps briskly through various components of ideology, I suggest seeing the film more than once to absorb Žižek's whole thought process. For a person who grew up in Communist Slovenia during the Cold War, and hailing from a Marxist/Anarchist perspective, Žižek is equally critical of all ideologies -- the Soviet Communism, Fascism, Capitalism and religion. With various examples of Soviet era war films and Nazi propaganda, he demonstrates the manipulative nature of ideology. While this film is intellectually complex and sometimes hard to follow, there are many brilliant moments that you just have to nod and smile. One of these is in the beginning, with John Carpenter's hidden gem of the Hollywood Left, They Live. Žižek begins his dissertation by the dumpster in a back alley in LA, where the epic fist-fight between Roddy 'Rowdy' Piper and Keith David takes place, because David's character refuses to put on the sunglasses that will let him see the hidden messages used by the yuppie aliens to control the human race ("Obey", "Money is your God" etc - all the good things about the Reagan years). Ideology is essentially the filter that we see the world through. Žižek uses different cultural examples to demonstrate how historic ideological movements manipulate the masses. Beethoven's 9th Symphony -- Ode to Joy, a world famous melody associated with a vision of fraternity amongst all human beings, has been appropriated by many political movements: Nazis, Marxists, Maoists and even the Shining Path -- believe it or not, these were all 'utopian movements' in their own minds. It was the national anthem of the apartheid government of Southern Rhodesia (present day Zimbabwe) and is now the anthem of the European Union. 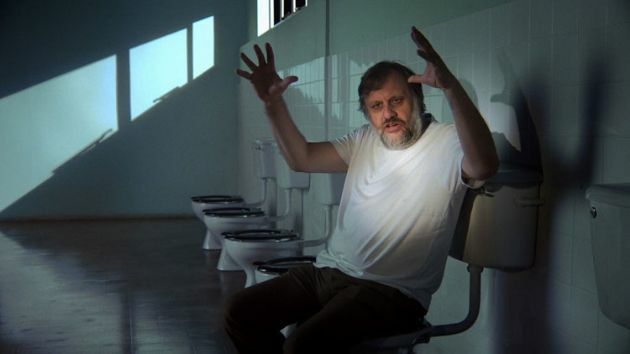 After the long historical montage, you are relieved to see Žižek sitting in the Korova Milk Bar from Clockwork Orange. The genius of Beethoven is not only utopian vision in music, but the realization that there are those who will always be excluded from this utopia, as illustrated by the carnivalesque version of the symphony's fourth movement heard in the scene where Little Alex prowls the shopping mall. Žižek dissects our advanced, capitalist system using Freudian psychoanalytic terms and Western philosophy, giving variety of cultural examples for the laymen: Sound of Music, Kinder Eggs, Starbucks, coke, Titanic.... He takes us to the Mojave Desert -- the gravesite of derelict airplanes, for us to witness the amazing amount of waste created by the current economic system. For those who are not familiar with Plato's Republic, he sites Dark Knight to explain the 'Noble Lie', a conservative view of the society where it is necessary for the rulers to lie because the public can't handle the truth. All this heady, intellectual inquiries are at times too much. 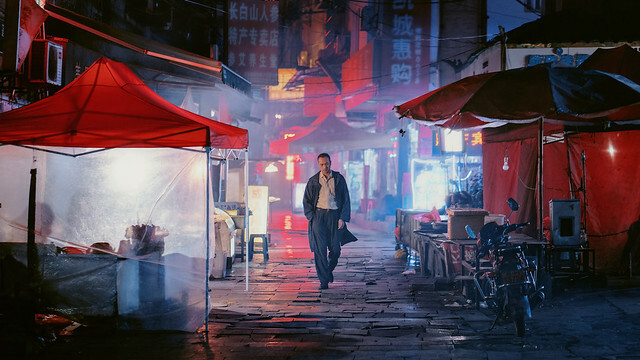 Fiennes deftly moves from one iconic movie setting to another connecting the dots and continuing visual threads to keep up with our motor-mouthed host and keep the film afloat. The movie settings are perfectly matched with the originals and the visual gags are clever and funny. Why do we so easily envision asteroid hitting the earth or the end of days rather than seeing a moderate change in our economic system? I saw him speaking eloquently about the possibilities of envisioning a different kind of world for our future at the Zuccotti Park, during Occupy Wall Street protests in 2011. With The Pervert's Guide to Ideology, he is suggesting us to examine the past, learn from mistakes and be a little bit of a realist in seeing the world. The Pervert's Guide to Ideology opens 11/1 at the IFC Center followed by other markets. Slavoj Žižek and director Sophie Fiennes in person Fri Nov 1 & Sat Nov 2 for Q&As following 6:45 shows. Plus book signing with Žižek for his new book Less Than Nothing: Hegel and the Shadow of Dialectical Materialism, Sat Nov 2 at 9:45pm – books on sale at lobby concessions stand. Please visit IFC website for tickets.